A high school hatchery protects endangered species and demands academic excellence. 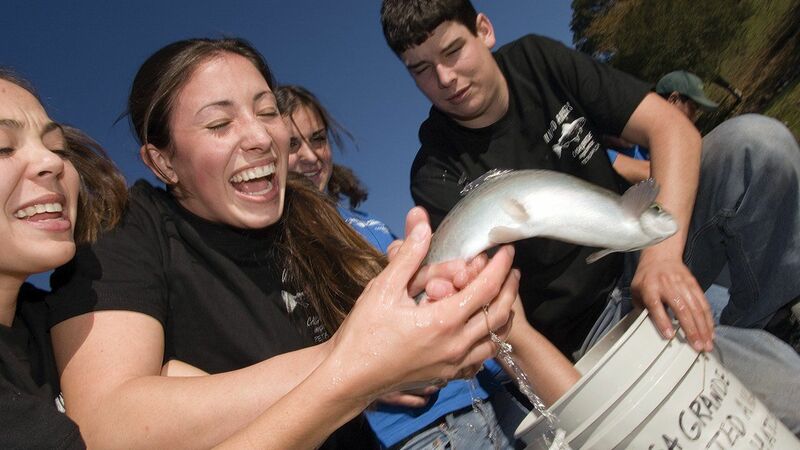 Group Effort: United Anglers Bianca Licata (from left) and Melissa Medeiros try to get a grip on releasing a rainbow trout as classmates Suzanne Arntz and Robbie Roland look on. 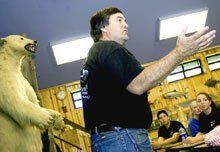 "Give a kid a chance to make a difference," says Tom Furrer, forestry and wildlife teacher at Casa Grande High School, in Petaluma, California, "and you unleash an incredible amount of energy." Furrer ought to know. Back in 1983, he pulled together a group of students to try to save a dying creek, and the energy his youthful eco-warriors generated resonates powerfully to this day. The United Anglers of Casa Grande, now in its twenty-third year, not only continues to maintain the revitalized Adobe Creek and its resurgent stock of endangered steelhead trout, but its twenty student members also run a state-of-the-art fish hatchery right on campus. And they've done it all with money they've raised themselves -- including more than $500,000 required to construct the hatchery and its $50,000 annual operating budget. It all began, says Furrer, because a few students were worried about the dying out of so many animal species. "The problem seemed so overwhelming, and the kids kept asking me, 'How can we make a difference?'" the veteran teacher recalls. "I felt this huge frustration because I didn't really have any answers." While puzzling over the problem, Furrer took a walk along Adobe Creek, which runs near the school. "Because of water diversions, it was nothing more than a dry crevice filled with rocks and litter," he says. "I crossed over a barbed-wire fence, and some guy started yelling at me for trespassing on his property. He calmed down, and we got to talking. I told him what was gnawing on me, and he said, 'Well, if you really care about animals, come help me.' He had a bucket, and he was dipping these baby steelheads out of a little pool. He said this was just about the last of them in the creek, and he was moving them to try to save them. Right then, I knew I had a project for my kids." Classroom Wilds: Tom Furrer, who teaches forestry and wildlife in Petaluma, California, stumbled on the idea for a hatchery project during a stroll. From the start, things did not go easy for Furrer's idealistic mission. There was public criticism about the project, and the school district refused to give the fledgling Anglers Club money for the planned restoration. "People thought I was misguiding the kids, that the creek was hopeless and we'd never save the fish in it," says Furrer. "But the fact that there have always been obstacles just makes the experience all the more powerful." In its first years, club members spent thousands of dollars and many hours renovating an old greenhouse to use as a hatchery to raise steelhead and salmon fry (hatchlings). Then, almost as soon as they got it running, the hatchery was condemned for not being earthquake proof. "They thought they'd have to shut everything down," says senior Kali Hurd, this year's Anglers Club president. "It was like, 'Sorry, kids, you tried -- that's life.' But Mr. Furrer said, 'Do you want to stop now?' And the kids said, 'We just can't let this die.' So, in 1993, the members raised $510,000 to build a hatchery." They did it through car washes, cake sales, raffles, lawn mowing, and big dinner parties: the United Anglers's annual Pasta Feed is now the largest fundraiser in Petaluma. But even though bringing in money is a priority, it's only a fraction of the students' workload. Club members come in before school to monitor the delicate incubation of fish eggs and maintain the swift-water raceways where the young fish grow. After-school cleanup chores can stretch into the night. When emergencies strike, as one did a few years ago when the power went out, students must be quickly scrambled to watch over the facility. 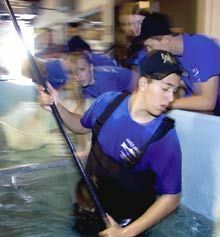 More Than Knee Deep: Joe Costarella nets hatchlings in the tanks in preparation for moving them. "This is definitely not a sit-down class," says Hurd. "We're either working in the hatchery or out along the creek or fundraising or giving tours. You have to make sure everything is working right, and if something's wrong, you fix it." Despite the high levels of politeness, cooperation, and hard work Furrer demands from his young charges, there is still intense competition to join the United Anglers elective class. To qualify, applicants must ace a written test and demonstrate an abundant concern for the environment. "Everybody knows it's a big-time commitment, but we still get people from every clique in the school: the goths, the cheerleaders, the jocks -- you name it," says senior Shala Thomason. "When I came in, I was so shy I couldn't talk to anyone, but you have to learn to be a leader. We get a lot of respect on campus, but you have to hold yourself to a high standard. If you get into a fight or anything, you're dropped." If there is a common bond among the United Anglers, it is clearly a love for animals. Hurd's dream is to work with endangered tigers, while Thomason's passion is horses. "What got me into this?" asks junior Joe Costarella, a two-year club member. "One word: fish. My dad's a wholesaler, and my whole family has always been fishermen, and I will be, too. I saw this as a chance to save the salmon and the steelhead and do what I could for the environment. Yeah, it takes time and dedication, but that's okay. That's what we learn here, that anything important takes just that." 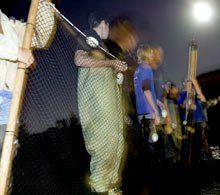 By the Silvery Moon: The United Anglers practice seine netting at night in the Petaluma River. Furrer says that the quality he emphasizes most to his students is resilience -- understandable in light of the setbacks the club has suffered over the years. Developers have damaged creek spawning grounds, county agencies have inadvertently cut down hundreds of shade trees the students have planted, and, despite all the volunteer cleanups the United Anglers have conducted along the 7-mile waterway, people persist in using Adobe Creek as a refuse dump. "These things happen -- these are the political realities -- and I don't try to shield the kids from them," says Furrer. "These students know that this is an ongoing project. It was here before them, and it'll be here after they're gone. They know there'll be ups and downs and you have to have persistence if you want to get anything done. I think it's one of the biggest lessons they get out of this." For Furrer, the United Anglers of Casa Grande has been a life-consuming project. Sometimes it has caused him angst, but, as he says, the joys have always outweighed the defeats. "Here I am, fifty-one years old, dirt poor, unmarried, with no serious relationship and no kids of my own," he says, chuckling ruefully. "All my passion has gone into the Anglers Club." "But my reward for twenty-three years of this is helping kids find their niche in life," he continues. "We have club members who've gone on to be game wardens and environmental scientists. One of my grads is a top stem-cell researcher, and a young woman who was an initial member now runs the Feather River Hatchery, the largest in California. That all makes me very proud. I have no doubt in the world that this is the reason God put me here." Go to "How to Keep a Club Swimming Upstream."